I LOVE the combination of lemons and blueberries! There is just something about the lemon that brightens the flavor of the blueberry. I had a craving the other day, so after a quick search on Pinterest, I found a recipe that seemed pretty easily adaptable to a gluten-free, dairy-free version. The result? Absolutely delicious! The perfect amount of lemon flavor to compliment the juicy berries, and a sweet lemon glaze to go on top. Pre-heat oven to 350F, spray a 9×5-inch loaf pan with cooking spray and set aside. 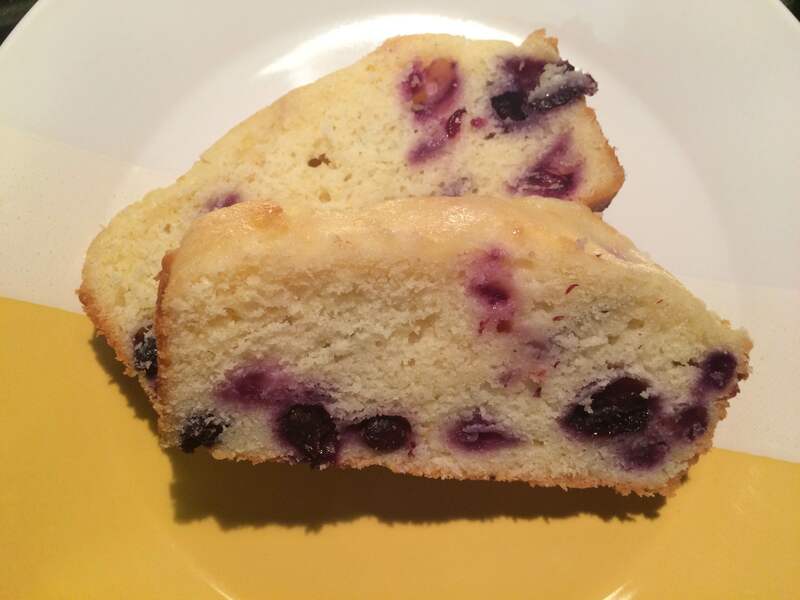 For the Pound Cake – To a bowl add the dairy-free spread and sugar. Beat until light and fluffy (approx 3 minutes). Add in the eggs one at a time, mixing well after each (scrape down the sides when needed). Add the lemon extract and stir to combine. Add the flour, baking powder and salt. Beat on low until just combines (approx 1 minute). DO NOT overmix. Add the lemon zest and stir to combine. In a small bowl, add the blueberries and sprinkle with 1 tablespoon brown rice flour. Lightly stir to coat (flouring the frozen blueberries helps keep them from sinking while baking and your batter from turning colors). Pour out half the batter into the prepared pan. Evenly pour out half the blueberries over the batter in the pan. Pour in the remaining batter over the blueberries. Evenly top with remaining blueberries. Bake for about 70-75 minutes or until a toothpick inserted in the center comes out mostly clean. Cool in the pan the stove top for 15 minutes, then turn it out onto a rack to cool completely before glazing. Make the glaze once the cake is cooled. Glaze – In a small bowl, whisk the lemon juice and confectioners’ sugar (start with 1 cup and add more if needed to get the right consistency) until smooth and combined. Drizzle glaze over the cake before slicing and serving. Bread will keep airtight at room temp for up to 5 days and in the freezer for up to 6 months (don’t glaze it until you plan to serve it if you’re going to freeze it).Keep bread in the fridge to keep it from getting too sticky. My husband’s favorite food is bread. Seriously. When we were dating, we would walk into the grocery store and he would head straight back to the bakery section to squeeze and smell the loaves until he had found the perfect one. And then to top it off, he would have it half eaten by the time we got to the checkout! So, when we all made the move to eating gluten free, I knew I had my work cut out for me to find just the right bread recipe. Thankfully, I have found a one that works well for our family. Well, 3 out of 4 of us anyway….Little Bit won’t eat it, but then again, she doesn’t eat most things…(more on that some other time). After searching and looking at a number of different recipes, I came across this one on Yammie’s Glutenfreedom. 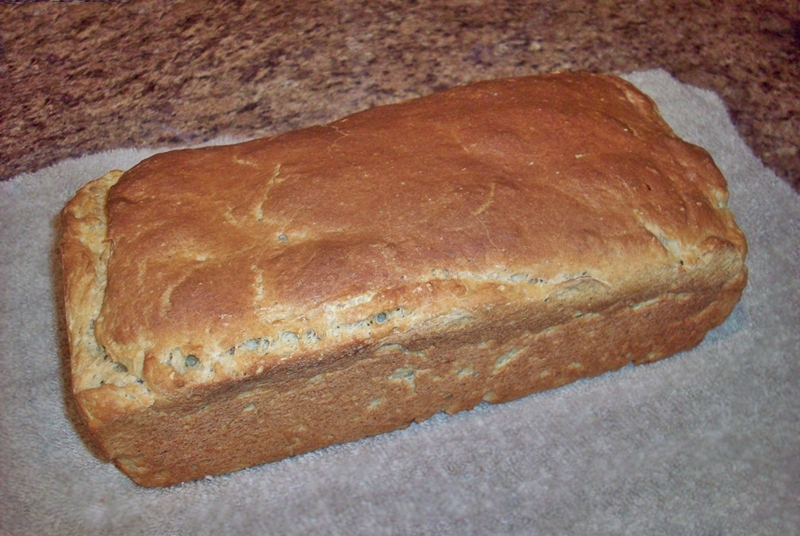 I did a little tweaking to the recipe and the method (it was a little too sweet for us and The Dude didn’t want cinnamon in his sandwich bread), and there is was…a fantastic, easy homemade bread recipe! Whisk to combine the yeast and the water and let sit for a few minutes (I just whisk the yeast into the 2-cup glass measuring cup I used to measure and warm up the water). Meanwhile, in a large bowl, whisk together the oat flour, rice flour, tapioca flour, xanthan gum and salt. Add the oil, honey, eggs, and lastly the yeast/water mixture. Beat for a few minutes until fluffy. Note: add the oil, then the honey using the same measuring cup. This will help the honey slide right out of the measuring cup since it will have had oil in it first. **Please make sure you DO NOT turn on your microwave while the bread is rising, especially if you are using a metal pan as that could be very dangerous! Be sure that everyone in your house knows that you have bread rising in there and that the microwave is out of commission for the next 45 minutes. While the bread is rising, preheat the oven to 350 °F. Once the loaf has doubled in size, place it in the oven and bake it for 45 minutes or until done. Remove from pan and allow to cool fully before cutting. Store in a sealed plastic bag. It will stay fresh on the counter for a 2-3 days (although it may start to get a bit on the crumbly side) or in the refrigerator for up to a week. It’s usually gone within a few days at our house though! Leave a comment and let me know how it turns out!